The real war on women: Canadian entrepreneur Steve Maman rescues more than 120 Christian and Yazidi girls. Even as Megyn Kelly wrestles with Donald Trump about his supposed “war on women,” Canadian Jewish businessman Steve Maman is helping save lives in the real war on women being waged in the Middle East by ISIS. Taking a personal example from Oskar Schindler, who saved thousands of Jews during the Holocaust, Maman told the Catholic publication The Tablet that he has overseen the rescue of more than 120 Christian and Yazidi girls kidnapped by ISIS in northern Iraq. Maman, 42, an entrepreneur, founded the Liberation of Christian and Yazidi Children of Iraq (CYCI) after the jihadists overran the cities of Mosul and Sinjar a year ago, turning more than 100,000 civilians, including virtually all the region’s Orthodox and Catholic population, into refugees. 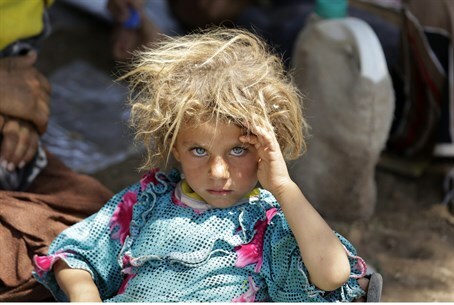 According to the report, in August of 2014, the jihadists took up to 7,000 Yazidi women and girls, some as young as 13, into slavery. An unknown number of Christian women and girls were also kidnapped. CYCI estimates that around 2,700 are still being held by ISIS. Maman works closely with a team of negotiators based inside ISIS-held areas, to reunite the enslaved Yazidis with their families. “We liberate children from their captors through the use of on-the-ground brokers,” he said. The charity receives money for rescue missions from Maman’s business associates, most of whom are Jews. The associates, he said, have been “remarkably generous.” However, he said that while he has approached about 60 church organizations in Canada, these efforts have been largely fruitless. CYCI collaborates with Anglican Canon Andrew White's Foundation for Relief and Reconciliation in the Middle East, which The Tablet says is providing shelter to hundreds of people who have fled ISIS.